Weighty Matters: Is Nothing Sacred? There's a general consensus out there that it's wrong to market junk food to children. Consumers and activists frequently shout out at the injustice of junk food's television commercials, shelf product placements and their insidious involvement with our schools. As far as safe venues go, they are few and far between, and now, there's one less of them, because your local public library may also be part of the problem. Try this exercise. 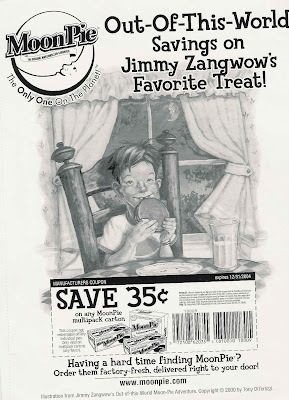 Go to your branch's website and in their holdings search look for, "Jimmy Zangwow's out-of-this-world, moon pie adventure" by Tony DiTerlizzi. 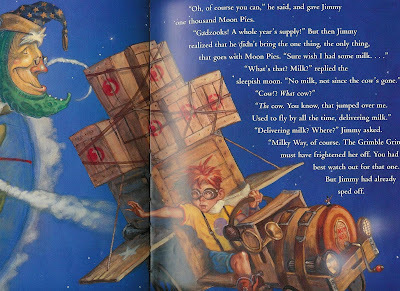 "This delightful romp follows red-haired, freckle-faced, goggle-wearing Jimmy Zangwow, budding inventor and adventurer, on a passionate search for his favorite treat, which his mother forbids him to eat before dinner." "The dialogue includes quirky sayings like "Holy macaroni!" and "Jumping june bugs!," which young readers will relish. Large double-page watercolor, gouache, and colored-pencil illustrations enhance the story. DiTerlizzi uses various perspectives to show just how tall the Grimble Grinder really is and to send readers topsy-turvy through space. With its repetitive text and large illustrations, the story is great fun for group sharing." Sounds like a great book for kids right? Not that it's not great, I can't say that because I haven't actually read it. It's not a great book for kids because it's not actually a book - it's an advertisement. It's a lengthy, illustrated advertisement for junk food that targets children. The junk food? You guessed it - Moon Pies. According to the Moon Pie homepage, the first Moon Pie was produced by the Chattanooga Bakery back in 1917 and while I couldn't find nutritional information on the Moon Pie site, I found it on a calorie tracking site and they're pegged at 220 calories per, or roughly the same number as a chocolate bar. 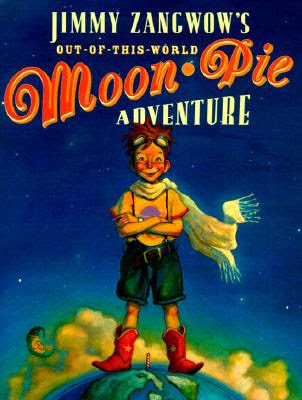 The "book" of course is sold on the Moon Pie website in their General Store, and why wouldn't it be, it helps to sell the pies. So 1,000 Moon Pies is a year's supply? I wonder what Jimmy did those few days that his parents didn't feed him 3 of them? Your very own coupon for Moon Pies.